How do I set up a New Account on your website? Can I use my old web account info on your new website? I am not able to log in to my online account. What should I do? I have set up a Web account previously, but I can't remember my password. What do I do? I've ordered from you over the phone before, why can't I log in? Once I create a Wish List, can I save it and access it later? Do you have a TLS™ Order Form available on your website? Do I have to submit a special form to order custom products? I already have my list of TLS™ item numbers. Is there a quick order option on your new website? I am looking for a special product but couldn't find it on your site. Can I get assistance with finding it? Does TLS™ offer assistance with designing library furniture projects? Do you provide installation services? I have a bid number/ quote number. Can I use it online? I have a coupon/gift certificate. Can I use it online? How do I cancel an order that I've placed online? How can I receive TLS™ printed catalogs? Will the same prices appear online and in your catalogs? How can I receive your Email promotions and grant info? What type of information do you send when I sign up for Emails? I need to have an exact freight quote before placing my order. What can I do? When can I expect my order from The Library Store? Are there things I should be aware of when my order is delivered? What if my cartons arrived damaged? What is TLS's commitment to me as a customer? Where is TLS™ located? How and when can I speak with a Customer Service Rep or Bid Specialist? Where can I find out more about The Library Store? To set up a new web account or log in, just click on the orange Log in button at the top navigation bar or use the bottom navigation bar and click on the New Account link. As you land on the Log in page, you will see the New Account link. If it is your first time to order from TLS, just use a credit card or if you are from a school, library or organization, just provide a can provide a pro or use the To open an account, please provide three business references and allow extra time for credit approval. Established schools, libraries, colleges or universities can place a first order by providing an official purchase order. If you have any questions, please contact us at 800.548.7204. No, unfortunately you will need to set up a new account on this new site. Your "Log in" name will be your email address. You will also need to set up a new password. This new website will require that you set up a new online account, even though you have ordered from us in the past. Your internal TLS customer account will remain the same; however your online account and password will be changed. Once you have set up the new online account, if you forget your password, simply click on the Forgot Password link on the Log in page and you will receive a confirmation via email. Just click the Forgot Password link on the Log in page. You will be asked to enter your Email address and after you click "Submit" you will be sent a new password by email. Once you have received your password, simply return to the site and go to the Log in page. We recommend that you change your password to one that you prefer to use, after you have logged in and can access the Manage My Account area. To change your password, just go to the Change Password tab. Unfortunately, having ordered offline does not automatically give you an account on our website. But setting one up is easy! Simply click on the Log in button on the top navigation bar, then select the New Account option and continue with your order. You will have to fill in all of your information for this order, but on subsequent orders you can log in using the My Account section and your information will be recalled. Yes, we hope that this tool will make your shopping experience easy. After you log in, as you browse this site, you will see the buttons for "Add to Wishlist" or "Add to Cart" on each product page. If you "Add to Cart" the item will be placed directly into your shopping cart (My Cart). You can also choose to add items into My Wish Lists by using the "Add to Wishlist" button. This will save time… simply place favorite products or items that you plan to order at a later date in My Wish Lists; they will be saved for your future shopping convenience. We recommend setting up your Wish Lists prior to choosing the "Add to Wishlist" buttons on the product pages. It's easy to organize different lists; just go to Manage My Account and select the My Wish Lists tab. Shopping Cart: For your shopping convenience, this site uses a "shopping cart" to help you order online. This shopping cart works just the same as a real shopping cart - it collects items you want to purchase until checkout time. Simply browse the site and when you want to purchase an item, just click "Add to Cart" and the item will be saved in an area called My Cart on our website. Items will be saved until you are ready to make your purchase. Once your list is completed, simply use the "Check Out" button. You will see a final list of items purchased with applicable taxes and freight costs. This is the amount that will appear on your invoice. Navigation: This site utilizes a "Search Bar" in the top navigation bar of this site. You can search by the TLS item number or by key words. You can also browse by product groups or categories by using the navigation areas on the top and left side of the site. Products are categorized by Supplies, Furniture, Equipment or Educational Products on the top navigation bar. The left navigation categories match our printed Annual Reference Catalog. Look for New Products, Clearance items and Shop by Brand options for easier browsing. Once we receive your order you will be sent an e-mail confirmation within 24 hours to the email address you supplied. You will also receive an email with all of your tracking information once your order has been shipped from our warehouse. Our order form is available on the bottom navigation bar… just click on Online Order Form. This PDF form can be printed as needed. Separate Custom Order Forms are required for custom products such as Engraved Signs, Custom Imprinted Book Pockets and Custom Bar Code Labels. The forms feature easy, step-by-step instructions so you can be sure that you'll receive exactly the right product. Just click on Custom Order Forms, print a form for each custom product, fill it out completely and include it with your order. For your ordering convenience, you'll find all the forms on the Custom Order Forms page, in the bottom navigation bar of this site or individual product pages. Please note that we cannot process your order for a custom product without a completed written form. You can place your order for custom products via phone, fax or online, however we cannot process your order until our customer service department receives your forms via email, fax or mail. 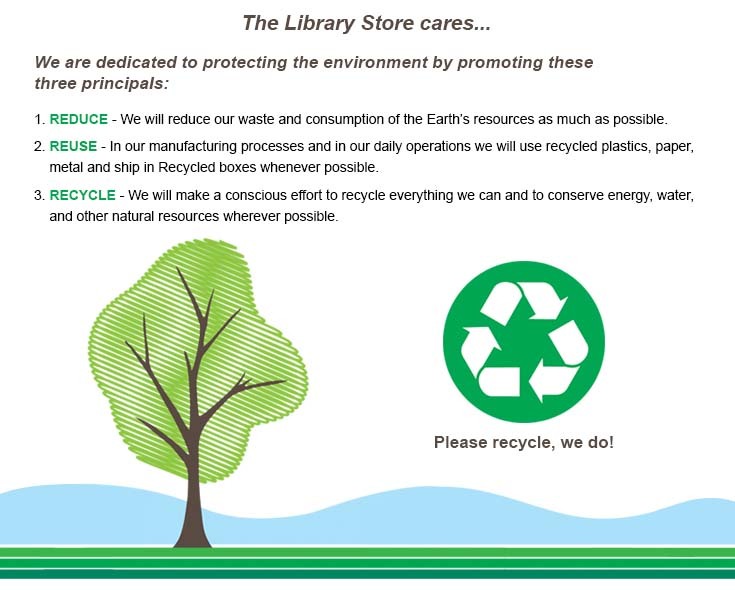 For prompt service, submit forms via Fax at 800.320.7706 or email them to customerservice@thelibrarystore.com. For additional guidance please call our customer service team at 800.548.7204. Yes, we recommend using Express Order. It can be found on the top right area on the top navigation bar and also under My Account in the bottom navigation area. This option is an easy way to order from TLS™ Annual Reference or Sale catalogs or when you are already familiar with the items you want to order. We love special orders! If you need help in finding a product that is not shown in our catalog or online, we can help you to find it from one of our many manufacturers. This site has a helpful form found in Looking for a Special Product? under Customer Care on the bottom navigation bar. The form will simplify the process and ensure that we respond as quickly as possible. For additional guidance please call our customer service team at 800.548.7204 or email us at customerservice@thelibrarystore.com. Does TLS offer assistance with designing library furniture projects? Do you provide installation services? Yes, we are happy to work with you on your upcoming room projects. We can offer multiple options that will meet your budget requirements. Our Bid Specialists offer planning, layout and installation services. Just contact Bids at 800.603.3536, M-F between 8:30-4:30 CST or email them at bids@thelibrarystore.com. For more information on our Bid department's services, see Bids & Quotes. I have a Bid or Contract from TLS™. Can I use my bid or contract number when I order online? Yes, our new site will allow you to use a bid or quote number when placing an online order. Simply add the correct bid/ contract number in the Catalog/ Bid Code box provided on the Log in page, Express Order page or at the top of your Shopping Cart. We highly recommend setting up an online account and logging in. By entering your bid or contract number in the box on the Log in page, you will be able to see accurate bid or contract prices on each product page – as you browse!. After you have added your product selections and "Ship To" info to your Shopping Cart, the correct extended pricing with accurate freight costs and any applicable taxes will be totaled for you! Just a reminder… special quote, contract or bid pricing cannot be combined with any other TLS catalog sale pricing or promotional offers. If I have a TLS™ Coupon or Gift Certificate, can I use it for my online order? Yes, our new site will allow you to add a code from a Coupon or Gift Certificate. Simply enter it in the Promo/ Coupon Code box at the top of your shopping cart (My Cart). The correct total will appear at the bottom of your order. For your convenience, TLS™ accepts Master Card, Visa, American Express or Discover credit cards/debit cards. Please provide the card number, expiration date and an authorized signature. The user's name and address must match the billing address for the card. Any shipping charges and applicable sales taxes will be billed to your credit card. When you need an accurate total for a prepaid order, we recommend adding your complete list of products with quantities into your Shopping Cart. Then use the "Calculate Shipping Costs" function to add the correct "Ship To" zip code. You'll get an accurate total that includes freight charges and any applicable state taxes. Please print this shopping cart page and send it with a check or money order so we can process your order promptly. Remit your prepayment and order via mail to: The Library Store, P.O. Box 0964, Tremont, IL 61568. If you require any assistance with freight/ shipping charges or have any questions, please contact our customer service department. We will gladly bill your current account. Terms are "Net 30 days" from your invoice date. Shipping charges and applicable taxes will be added to your invoice as shown on your web order. To ensure that we bill your account for an online order, as you proceed through the Check-Out process and arrive at Payment Method on the Billing Information Page, select your preference as either "Purchase Order" or "Invoice Me". We will bill your current TLS account appropriately. If you require any assistance or have any questions, please contact our customer service department. If you do not have an open account with us, and would like to place your first order, you can prepay for your order with a credit card, check or money order. To open an account, please provide three business references and allow extra time for credit approval. Established schools, libraries, colleges or universities can place a first order by providing an official purchase order. How can I receive a TLS™ printed catalogs? Just go to the Request Catalogs link shown on both the top and bottom navigation bars of this website to place an order for a TLS™ Annual Reference Catalog or TLS™ Sale Catalogs. If you have ordered from us recently, your name will be added to our customer list and you can expect to receive catalogs regularly. Not always… Our sale catalog promotions for some key products may also be "on sale" on our website; however additional exclusive Web-Only or Facebook Fan-Only offers are generally not available anywhere else. To see what is on sale on our website, see the Sale tab on the bar on our home page. To ensure that you are able to get the special prices shown in TLS sale catalogs, just log in, go to My Account and then enter the catalog code that is printed on the back cover. As you browse the site, the sale catalog prices will be shown accurately and carried into your shopping cart. You can also use the Express Order service and enter a catalog code. The sale prices will be added to your cart for items that are in that catalog. Just go to the Email Sign Up link shown on both the top and bottom navigation bars of this website to enter your information. Note that you will be asked for information that will allow us to send only relevant information to your email address. The sales available on this website may not be offered anywhere else! TLS™ negotiates special Web-only offers with many suppliers that will offer promotions for a limited time. Also all overstock or clearance sales are available online only. 1. Written Quotes. If you require an accurate, guaranteed freight estimate prior to placing your order, just contact our customer service department for a written quote. You'll be invoiced exactly for the costs quoted. For Customer Service contact info see Contact Us. 2. Quantity Quote Service. An easy way to get a written freight estimate for high volume orders is to use our Quantity Quote Service. You'll receive an accurate, written quote with all product and freight costs included, within 24 hours (48 contiguous states only). 3. Bids and Contracts. Freight costs may be included on bids or contracts with The Library Store. Please note that for high volume, large furniture shipments, we recommend that you contact a bid or customer service representative for accurate freight estimates. You may require special delivery services that require additional charges. For contact info, please click on Bids & Quotes Department. 4. Shopping Cart. After adding the items you need to your shopping cart (My Cart), simply Calculate Shipping Costs by adding your "Ship To" information. You 'll receive an accurate estimate that includes freight and applicable sales taxes. For your convenience, this cart page can be either printed or emailed. Once you have prepared an order, please review it to ensure that we are not missing important information such as color choices. Missing information will delay an order. Note also that you may receive multiple shipments if you are ordering supplies and furniture on the same order. Indicates that a product is in our warehouse and will ship the same day that you place your order. (Orders must be received by noon, CST.) To estimate a delivery date, please add 2-7 business days to allow time for transporting to your location. Indicates that a product will ship either from our facility or directly from the manufacturer within 10-14 business days upon receipt of your order confirmation to our office. To estimate your delivery date, please add 2-7 business days to allow time for transporting to your location. Most furniture and equipment products ship directly from our manufacturers' facilities. Lead times for furniture and equipment products may vary by manufacturer and season. If you require delivery by a critical date, please call our customer service department or bid department prior to placing your order. We also recommend noting critical delivery dates on your order. • Note that items missing from the packing slip may be discontinued, back-ordered for later shipment, or shipped directly from one our manufacturers. • If an item shown on the packing slip is missing, please contact us at 800.548.7204 for an immediate replacement. • Confirm that you received the correct number of cartons as indicated on the bill of lading. • Carefully inspect each carton for damage. Please note on the delivery receipt any visible damage or imperfections on the outside of the cartons or compensation cannot be guaranteed. • Check the contents of your cartons against your packing slip. • Note the damage directly on the delivery receipt (before the driver leaves) as the trucking company is responsible only if you note this immediately. • Please keep all cartons and packing materials together with your damaged merchandise. • Call our Customer Service Department within 48 hours. If a return or exchange is necessary, please contact us within 6 months of the invoice date. Before returning any product to TLS, please contact a customer service representative at 800.548.7204 between 7:00am - 5:30pm (CST) Monday through Friday. To return "In-Stock" items, you must include a copy of your invoice or a packing list so we can properly credit your account. To return items shipped directly from one of our many manufacturers, please call our customer service team for an RMA # (Return Merchandise Authorization number) and return shipping instructions. This RMA information must be included in any return shipments to proper credit your account. Please note that a restocking fee may apply for some returned products. Products that are custom engraved, manufactured or imprinted cannot be returned. Some furniture or special ordered items are non-returnable per our manufacturer's terms. To ensure that you receive full credit for a returned item, please package items carefully in their original cartons. Products must be received in the resalable condition. Only complete, unused packages will be accepted for credit. Credits must be used within one year. To exchange a product, we will promptly process your replacement order upon receipt of the original item. Freight charges may be added to the invoice for an exchanged shipment. Exchanges can be made within only within 6 months from the invoice date. No questions asked! If you are not happy with any of our products, please contact us. We will gladly exchange the product or provide a refund. Note that some manufacturers will not accept returns on custom manufactured items. Please contact our customer service department with any questions. We will not be undersold! If you see a published price from any other current printed catalog from our competitors, for the exact same product, we will match pricing, as possible. Just submit a copy of the current competitor's catalog ad to our Customer Service Department. Prices & Terms - We make every effort to hold our prices for the life of the catalog. The current standard prices, shown in our Annual Reference Catalog and on this website, are effective January 1st through December 31st. We will honor current prices unless drastic economic conditions force us to pass along price increases. Prices are shown in US dollars and apply only to shipments to a US address. Also, we reserve the right to correct any pricing errors. Special Order Items - We work with many manufacturers from all over the world and look forward to helping you to locate the right product for your needs. If you need guidance on products options not shown in our catalog, such as custom colors, finishes, sizes or accessories, please contact our Customer Service Department. Or for your convenience, use the helpful form found in Looking for a Special Product? under Customer Care on the bottom navigation bar. The form will simplify the process and ensure that we respond as quickly as possible. Please see the Contact Us for detailed contact information. We invite you to read about TLS on this website. Please visit the Our Company page.